This is a self-correcting exercise. Click on the letter (A, B, or C) or "Quiz Yourself" for a pop-up box with the response. Note: If you do not see a pop-up box, check your pop-up blocker settings in your browser. If that is not the problem, try closing the previous pop-up box or check to see if the pop-up box is behind your browser window. If you still do not see the pop-up box, you may need to update your browser. Peripheral IV catheter insertion is a common nursing procedure often required for the administration of chemotherapy, antibiotics, blood products, fluids, and other medical therapies in hematologic patients with cancer. Although necessary and usually brief, IV insertion often is a source of patient anxiety and discomfort and can be extremely difficult to achieve, particularly in individuals receiving repeated courses of chemotherapy. Unfortunately, not all IV insertions are successful on the first attempt; multiple attempts may occur, which may cause patient distress and anxiety and increase costs as a result of additional supplies and nursing time. Nurses currently use various techniques, including heat, to improve the success rates of IV insertion; however, few are based on evidence. (Fink RM, 2009) In an effort to improve the patient experience you are asked by the Nursing Council to look at the evidence for using dry versus moist heat for IV catheterization. Is dry or moist heat more effective at reducing pain and anxiety? Does heat help improve the time to insertion of an IV catheter? Is dry or moist heat helpful in reducing pain and time of IV catheter insertion in patients undergoing chemotherapy? Choose the best PubMed search strategy to address the clinical question. population. Oncol Nurs Forum. 2009 Jul;36(4):E198-204. doi: 10.1188/09.ONF.E198-E204. PubMed PMID: 19581223.
attempt, had significantly lower insertion times, and was more comfortable. Heat type had no effect on patient anxiety. 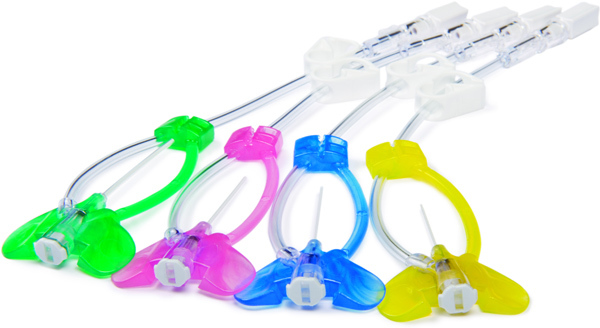 comfortable, safe, and economical to use in an outpatient oncology setting. You will need to read the full article to address the validity questions. Click on the link above to get a free copy of the article. Evaluating the medical literature is a complex undertaking. You will find that the answers to the questions of validity may not always be clearly stated in the article and that you may have to use your own judgment about the importance and significance of each question. Concealed allocation: Was group allocation concealed? Baseline characteristics: Were patients in the study groups similar with respect to known prognostic variables? Blinding: To what extent was the study blinded? Intention to Treat: Were patients analyzed in the groups to which they were first allocated? Equal treatment: Aside from the experimental intervention, were the groups treated equally? What are the results & how can I apply them to patient care? Results: Controlling for prewarming vein status, dry heat was 2.7 times more likely to result in successful IV insertion. After controlling for preinsertion anxiety, vein status, and the participants’ number of venipunctures in the prior year, dry heat resulted in significantly lower insertion times than moist heat. No significant difference was found between the heat modalities or between nurses on postinsertion patient reported anxiety scores. Dry heat was associated with significantly higher participant self-reported comfort after controlling for preinsertion anxiety and vein status and the participants’ numbers of venipunctures in the prior year. The results are reported as a continuous variable (change in scores). This does not allow for calculations of Absolute and relative differences or number -needed-to-treat. Were the study patients similar to my population of interest? Does your patient match the study inclusion criteria? If not, are there compelling reasons why the results should not apply to your patient? You bring this article to the Nursing Council and any other studies that you found to address this issue. The Nursing Council needs to consider the results of thess studies, the benefits, the adverse effects, the cost and the training involved in changing clinical procedures. All of these factors need to be factored into a decision.